A comfortable country 'home away from home'. Country comfort is what you will find at your home away from home ... Ten Twenty One! This large welcoming home is where you can rest and relax! We are situated on the road to the Fraser Coast ... Rainbow Beach, Fraser Island and Tin Can Bay well known for daily dolphin feeding and fishing activities ... and only 12 minutes to the center of Gympie!! 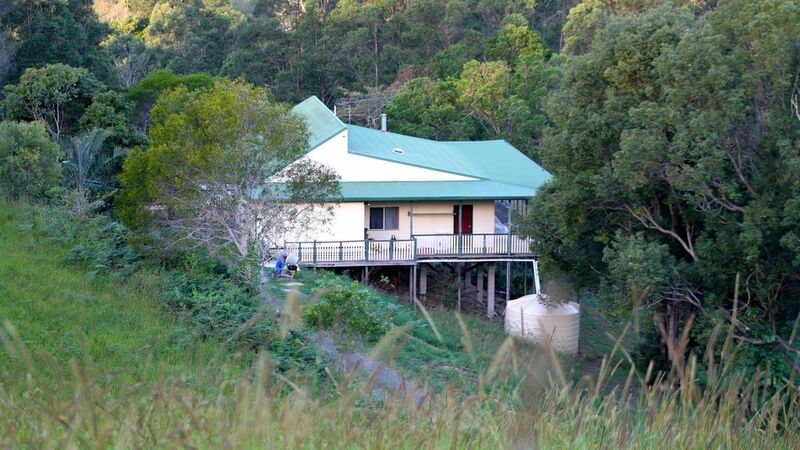 The home is situated on 32 acres, is private, surrounded by bush and you will likely wake to birds and wallabies. We hope you enjoy your stay. This home is one of two on 32 acres. The owners home is approximately 100m away affording you plenty of privacy. The house is set in a bush setting with the verandah overlooking a dam, a restful space to sit and relax. This spacious home has 3 entrances (front entrance, veranda and laundry access) a large lounge with fireplace for the winter months and reverse cycle air con for all year round. The dining table comfortably seats 8 and there is another 8 seat dining table and chairs on the verandah giving you extra options. A reading nook completes the space with books, games and jigsaw puzzles and toys for the younger children. TV, Chromecast, Foxtel, DVD, stereo and wifi. There are 5 bedrooms 4 of which are private/separate ( the house can sleep up to 10). The master bedroom has a king size bed, en suite and bedroom leading off it which has a fold down bed (double) as well as an alcove that holds a cot and change table ( if you want to use this extra bed please let us know so that we can make arrangements for use - extra charges apply). There are 2 queen size bedrooms and a bedroom with 2 single beds. One of the queen bedrooms now has a sitting room and en-suite attached. The kitchen is fully equipped and ready for any meals you wish to cook (there is a BBQ outside as well). The laundry has a washer, dryer, iron/ironing board and there is an external clothes line. On the verandah is an outdoor setting and the above mentioned dining setting. Access to the property is off Tin Can Bay Road, the property is well signed and we have blue Bali flags to show the entrance. There are approximately 2 acres of land with the house. There is plenty of parking. Your hosts or a substitute hosts are on site and will be there to welcome you to the best of their ability. We ask that you do not wear shoes in the house due to the polished floors. We provide disposable slippers or you can bring your own!! We invite our guests to come and have a chat about the home and the surrounding area, events and day trips they might like to undertake. We will do our best to accommodate your requests. Please NOTE. An accurate number of guests MUST be indicated as the number of rooms and beds made available will be in direct relations to this. Let us know your requirements and we will do our upmost to accommodate and meet your needs. Ray and I have traveled extensively throughout Australia and love the outback. Ray maintains the property and continues to add little touches such as building rock walls and planting trees. Weekends are spent with friends and family, relaxing and enjoying life. toilet, shower, This en-suite is connected to one of the queen bedrooms. Table setting for 8 inside and outside. Franca and her group were lovely and we enjoyed having them at our home. Thank you Franca for taking such good care of our property. We are on the door step of the beautiful and world heritage listed Fraser Island. Rainbow beach and Tin Can Bay are a short drive away (for Australians) ... you can surf at Rainbow Beach and go fishing or dolphin feeding at Tin Can Bay. If you prefer the busy lifestyle then you can take a lovely hinterland tour/drive to the famous Noosa Beach. Along the way you could call in to the Kin Kin Hotel or have a picnic at Harry's Hut! There a rock pools a little closer by and we can direct you to those very special place. On Sundays you may wish to stroll to the local markets or investigate Mary Street and have a coffee and cake? Check out the compendium and come and have a chat with us about the kind of things you might enjoy in our area.